What Are Rich Snippets and Schemas in Google Terms? A rich snippet is a Google term for extended information displayed in search results. 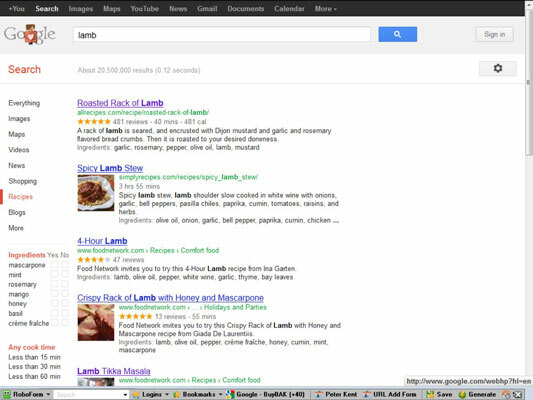 For instance, search Google for, say, lamb and then click the word Recipes in the left column, and Google knows that you are looking for lamb recipes. You’ll notice a few things; the search results contain both pictures and ingredient lists; some contain star ratings; and Google has a grid on the left side, which allows you to filter the results to show, for example, only the recipes that include mint, or those that do not use mint. You can even filter using the Cook Time and Calories tools. Google is able to provide these rich snippets thanks to special codes used in the HTML that identify each piece of information to the search engine; Google is able to extract the information, store it in a manner that it understands the data, and display it in the search results. Google introduced its rich snippets in 2009, reading certain microformats or structured data markup. Check out information about the Google rich snippets markups. However, Google now also recognizes schemas, which is also used by Bing and some other search engines (though today Google recognizes both its rich-snippet markups and the schema standards). Google provides a great little Rich Snippets Testing Tool that helps you learn by example. Enter the URL of a page you think has been coded, and the tool pulls the data from the page and extracts the individual fields. Simple, eh? Well, not entirely. It can take some figuring out, but if you have specialty data such as the preceding listed types, you should spend some time reading up on this stuff.